Nutritionally supports concentration, clarity and memory. Brahmi traditionally used in Ayurveda as a brain and mind tonic. It has helped spiritual seekers for millennia to attain the wisdom that they sought. It is used to naturally revitalize nerve and brain cells, to increase mental capacities, memory, concentration, intelligence, mental endurance, verbal articulation and to decrease senility, stress and stress related diseases. Promoting the clarity and mental balance needed to remain calm and efficient in today’s busy world and reducing anxiety and stress; it is an excellent formula for active people and students of all ages. For decades it has been used in the west as an energy tonic and as a smart drug under the name Gotu Kola. It promotes both physical and mental longevity, reduces negative emotions, related to the liver* and has an influence on kidneys and adrenal glands as well. Furthermore it builds up nerve cells and detoxifies the brain and the nerves from toxic deposits of heavy metals. Improves memory, increases learning capacity, and relieves stress and anxiety. Ideal for students and the elderly. Traditional Ayurvedic practitioners utilized the herb for a number of conditions. It was used as a blood cleanser and to treat fevers, inflammations, joint pain and a variety of skin problems such as eczema, psoriasis, boils and ulcers. Brahmi is also reputed to stimulate hair, skin and nail growth. 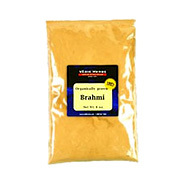 Brahmi herb powder WC is shipped in a discrete, unmarked package. Orders are processed immediately and usually take about 3 to 5 working days to be received. Any information received is used only for order processing and shipping purposes. Your information, such as e-mail address, will never be disclosed to a third party.